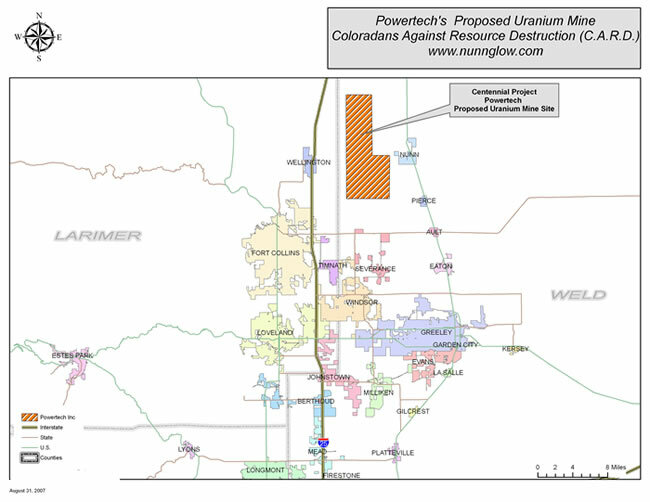 Powertech Uranium Corporation has obtained the mineral rights and mining leases to 6,880 acres in northern Colorado's Weld County where they intend to use both open-pit and in-situ leaching (ISL) to mine uranium. This Weld County site has been named the Centennial Project. The Centennial Project is about 80 miles north of Denver and 13 miles south of the Colorado-Wyoming state line. Interstate Highway 25, which connects Denver, Fort Collins and Cheyenne, runs three-to-five miles west of the project. The proposed uranium mining site is approximately 11 miles northeast of Fort Collins and 16 miles northwest of Greeley. The southern area of the project where open-pit (conventional) mining is planned lies between the towns of Wellington and Nunn. In-situ leaching is proposed in the north area of the project and open pit mining in the south area. Click here ( ) to see a map of Powertech's Mineral Holdings in the proposed uranium mining site. The U.S. Land Grant Bill of 1862 gave alternating sections of land for a distance of 20 miles on either side of the railroad to the Union Pacific Railroad. This grant included both surface and mineral rights. Since 1862, the majority of the surface rights were sold into private ownership while most of the mineral rights were retained. When uranium was discovered in Weld County in 1969, Rocky Mountain Energy (RME) a subsidiary of Union Pacific Railroad, controlled the mineral rights to over 115,000 acres of Union Pacific’s Land Grant. 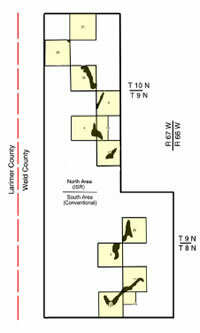 Other uranium exploration companies, such as Wyoming Mineral Corp. (the uranium production company of Westinghouse Electric Corp.); Getty Oil; Mobil Oil Corp.; and Powerco, began buying up the mineral rights to non-Land Grant sections near and next to RME properties for their own exploration programs. 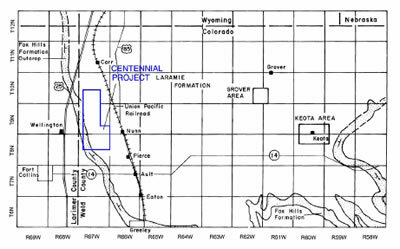 In 1974 RME began exploratory drilling for uranium at the Centennial Project while Wyoming Mineral Corp. was drilling on their project in Keota, just 42 miles to the east. Since the price of uranium has skyrocketed due to foreign demand, Powertech believes the Centennial project’s inferior ore has good characteristics for In-Situ Recovery (ISR) development. In addition, they note significant additional exploration potential exists in the immediate project area. 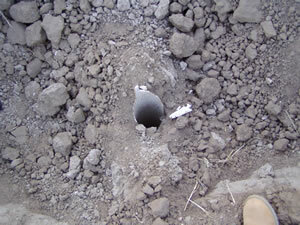 Uncapped drill holes are a primary cause of in-situ uranium mining contamination. It was common in the 70s and 80s for uranium mining companies to leave their drill holes open and exposed. 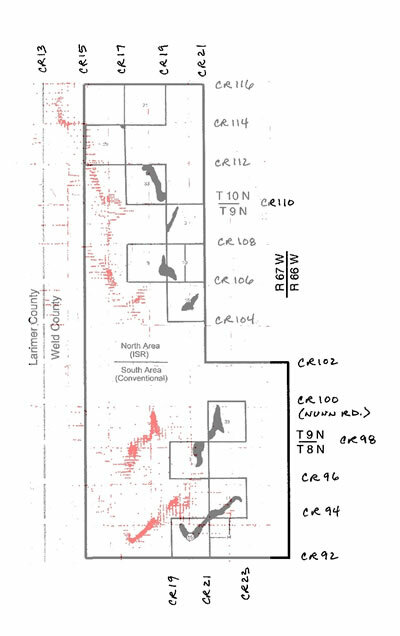 Evidence shows many drill holes were not properly capped, if capped at all, at the Keota site. Because of the careless mining practices recorded at Keota, there is concern RME’s 3,500 drill holes in the Centennial project were not properly capped. Some drill holes from those early explorations were exposed by Powertech while conducting ground work for new exploratory wells within the Centennial project, as can be seen in this photo taken by a CARD member. Uncapped drill holes are not the only current concern at the Centennial site. 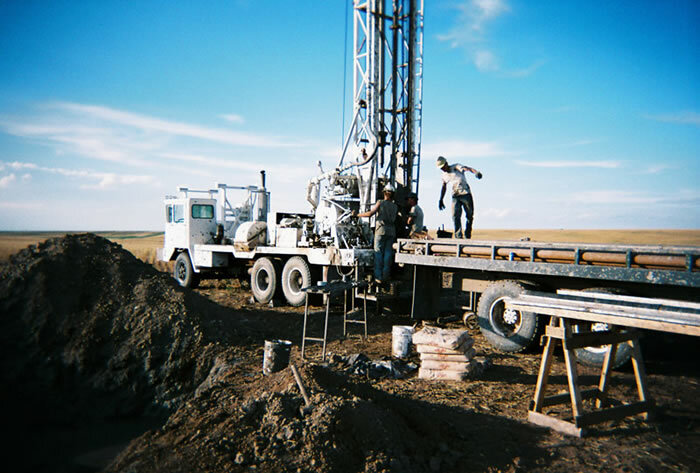 On July 16th, 2007, Powertech began exploration drilling on property they purchased near Nunn, Colorado (see image at the bottom of page). Click here ( ) to see a map of wind directions and communites downwind from the Centennial Project.